This entry was posted in EN and tagged news on June 1, 2012 by FEMEN. This entry was posted in ES and tagged noticias on June 1, 2012 by FEMEN. 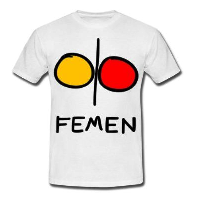 - FEMEN, " , -".
" , -2012, -. FEMEN ! ", - FEMEN . , , " -" . , 31 FEMEN -2012 . This entry was posted in RU and tagged новости on June 1, 2012 by FEMEN. This entry was posted in UA and tagged новини on June 1, 2012 by FEMEN. This entry was posted in UA and tagged блог on June 1, 2012 by FEMEN. This entry was posted in RU and tagged блог on June 1, 2012 by FEMEN.